Not quite the most popular shirt in franchise history (a couple to follow in the 50s and 80s win that award), but there are 25 different players who can claim it as their property during time with the Tampa Bay Buccaneers. 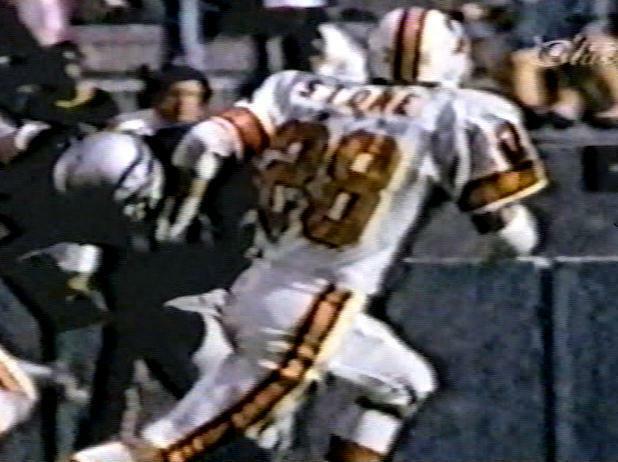 Ken Stone started every game at safety in the expansion season and Anthony Davis was a former Heisman Trophy winner at USC who briefly joined his former college coach John McKay in Tampa. Mel Carver was a back-up to James Wilder who made a couple of starts in 1982 and Stanford Jennings once returned a kickoff for a touchdown in the Super Bowl for the Bengals. Curtis Buckley was a special teams' demon who started two games at WR when Sam Wyche wanted him to go for the knees of an opposing cornerback on the first play from scrimmage. 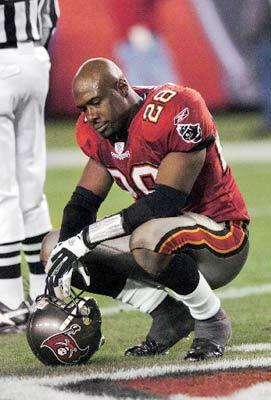 But only one player can ever truly be associated with No.28 and that is one of the smallest Bucs ever too. 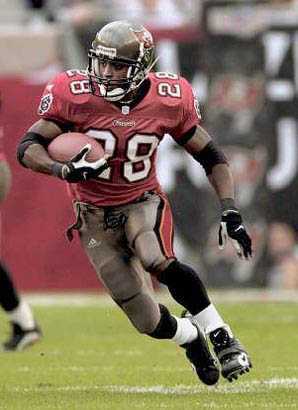 Warrick Dunn was a first-round pick in 1997 and spent five great seasons in Tampa, posting a pair of 1,000-yard seasons and he left the Bucs as their second leading rusher. After the non-entity that was Travaris Jackson, our Super Bowl MVP Dexter Jackson returned to Tampa in 2004 and took this number as his previous 34 jersey was being used. At the end of that season he returned to his regular number, leaving the likes of Donte Nicholson and Lionel Gates to add to the list of players with 28 in their wardrobes. Tanard Jackson took the number as a rookie but then handed it over to Warrick Dunn on his return to the Bucs in 2008 in favour of the 36 jersey that he then made his own. But since then, it seems to have been the property of back-up and third down running backs with 2016 first-round pick CB Vernon Hargreaves not looking so good in his second and third years as he did his first.